Franchise Training & Support | All Pro Franchising International Inc. If you’re worried about opening your own commercial cleaning services business because you lack experience in cleaning, or have never owned your own franchise before, keep in mind that prior experience is not necessary for our model. Most of our franchisees have never worked in the commercial cleaning industry before, nor owned their own business. However, we do expect our franchisees to possess an entrepreneurial spirit, a willingness to learn about a new industry, follow a proven system, and work in a team environment. Successful franchising for executives depends largely upon a strong system of support and guidance, and we have a solid infrastructure in place to equip franchisees with all the tools they need. We will teach you how to take your existing sales and management skills, or other relevant experience, and apply it to building your new business. We know that there’s always going to be a learning curve with any new business venture, but our goal is to minimize that learning curve as much as possible and help you make a smooth transition into franchise ownership. We provide training in a variety of areas so you can hit the ground running when you open your All Pro Cleaning Systems franchise. Here’s a list of what we’ll teach you. 1) How to set appointments with potential customers. 2) Preparing a detailed proposal. 3) Successfully signing and securing new customers. 4) Advertising to find and sign Service Providers (independent contractors), who will be performing the services for your customer accounts. 5) Hiring and training an Appointment Setter/Sales Assistant to set First Visit Appointments for you with potential customers. 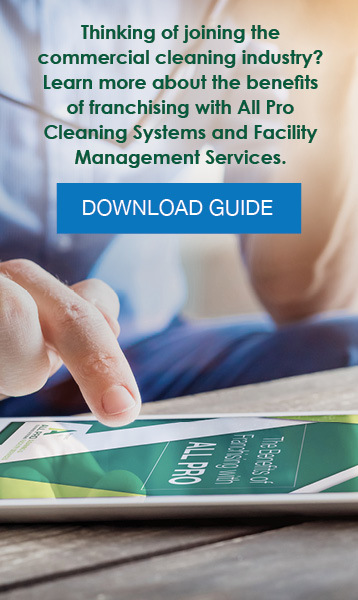 6) Hiring a Facility Services Manager who has industry cleaning experience to help with doing walkthroughs with service providers who will be cleaning the customer accounts, as well as performing other customer service duties. 7) Hiring a Facility Services Manager who has industry experience, and will be doing walkthroughs with Service Providers in your new customer accounts and will be the main contact person with your customers. 8) Hiring and managing an Outside Sales Executive when you are ready to start scaling the business faster. In addition to our training services, we also supply everything you need to succeed, from marketing campaigns to administrative support. Our materials are designed to maximize the management and operation of your business, and address any obstacles you may encounter along the way. While we do what we can to equip you for success, ultimately your success depends entirely on your commitment to working hard and providing outstanding customer service. Our franchising program for executives is ideal for sales and marketing professionals all over the country, looking for their next big career move. However, our model is designed so that even the business-minded individual with little sales experience can still be successful. That’s the beauty of entering a franchise opportunity built upon a tested and proven business model. Starting your own commercial cleaning and facility services business anywhere you want has never been easier than with All Pro Franchising International Inc. To learn more about our franchise investment, training programs, and support materials we provide, or to take the first step toward starting your own All Pro franchise, reach out to All Pro Franchising International Inc. today!